Bakersfield Observed: Sure everything must change, but even Floyds? Floyd's Stores are great businesses! Yes, you can find unusual items other hardware stores may not carry...anymore. Just a new location, same great customer service and friendly cashiers. It's a bigger store! Same great merchandise! As long as it's a change for the better, I say "Go for it!" 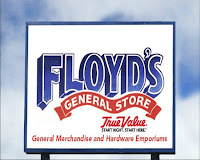 How exciting for Floyd's Stores! They may lose a little of the ol' dusty charm but they'll definately lose the drug deals at the corner telephone and the loitering on the front sidewalk and parking lot area. I for one will feel much safer going into Floyd's Stores now. It's a family-owned business and a VERY positive move for them! I'll miss the narrow aisles finding unexpected treasures in odd places but I understand the need to "spread out." I used to shop at the store on S Chester when I lived nearer that one and found it easier and bigger to shop in. Still....I'm a nostalgia buff. I'll be at the new one anyway, as soon as I find out the opening date. I like your blog and read it often. In our shared pursuit of accuracy, a few minor comments. First, "North Chester Avenue" begins on the north side of the Kern River in Oildale. Floyd's and San Joaquin Hospital are located on simple, non-directional Chester Avenue. Second, the improvements you mention near San Joaquin are, indeed, noteworthy. However, almost all of them from 24th Street to Garces Circle are part of the City of Bakersfield's continuing streetscape efforts around town and paid for with public funds. Thanks for the corrections. I never knew the distinction about when North Chester starts and ends. So thanks much. Also wasn't aware that the city was behind the streetscaping, which is really nice. This is why fact-checking is a good idea. Making a few calls. Looking at a map. Not assuming what you think is true really is true. Blogging is different than being a fact-checker, but bloggers seldom let facts get in the way of a good story.